I am not sure where it came from, but my parenting style is basically an obsessive quest to question everything. My mother wasn’t that way. Her parenting was pretty instinctual. She spanked us when she thought we needed it, gave us plenty of kisses, encouraged us to play outside and rejected the abusive way she was raised. My dad was very hands-off. He did try to teach us to be civil, not use profanity, and to have an appreciation for art and theater. However, I don’t think he gave parenting much thought. So although I can’t trace the origin, I have been on an information quest from almost the second of conception of my boy. It started with pregnancy nutrition and growing a healthy baby. I’m embarrassed to admit that I actually played classical musical through headphones on my stomach, just in case that actually would help my baby be smarter. I even created a website in which I updated WEEKLY, sometimes DAILY, my pregnancy symptoms and the growth of my boy. How obnoxious. Wow. I then moved onto researching labor and delivery. I read everything I could. I was like a crazed maniac trying to solve some complicated mystery. I don’t know how many books, articles, websites I read, but it was too many. Far too many. After he was born it didn’t stop. I subscribed to a newsletter that told me every milestone my baby should be on, and then flatly rejected it. I read book after book to try to establish what felt right to me. I questioned EVERYTHING. I took nothing for granted. Why did I do all this you ask? It’s not because I love my children more than anyone else. Nope. It’s not that I wanted to “one-up” my mom or anyone else. No way. It was because I wanted to be good at something. Really good at it. I wanted to rock this motherhood thing. I wanted to be perfect. Perfection is a tall order. It will come as no surprise that I was constantly disappointing myself. I remember when my little girl was just a few days old I got sick. Nursing had been a nightmare. I was confused because I’d had this beautiful home birth and now things were awful. I remember crying, shaking from a high fever, digging my toes into the carpet in immense pain and still feeling guilt that my 2-year-old was watching a cartoon. When I finally got help the lactation consultant actually yelled at me. It was just what I needed. I accepted that because I had no choice. I did not like it. Not one bit. Over the last six years I have had to learn that lesson over and over. Needing help does not make you weak, it makes you human. I am still learning to trust my instincts and do what feels right, even when others look at me like I am crazy. I wish I could get there quicker and that I could just relax and stop questioning so much. This leads me to rice crispy treats. I have so many food issues that I could write 50 blogs about those and not even scratch the surface. So let’s just say, I’m crazy when it comes to food. I have consciously tried not to pass those issues onto my kids. I nursed both kiddos until almost 3. I made homemade baby food and didn’t let them taste sugar for as long as I could. I try, REALLY I DO, to not use food as reward. My kids know what GMOs are and about organic food. They know why I’m picky about the animals we eat and have seen images of what commercial chicken farms look like. 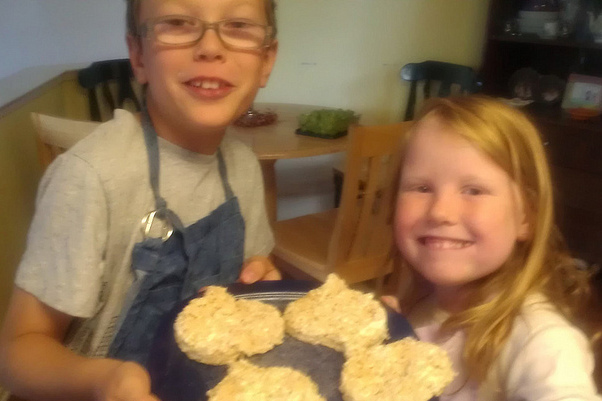 I want my kids to be informed consumers in every aspect, particularly about food. However, I do think that sometimes I am robbing them of simple pleasures that other kids have. That brings us back to rice crispy treats. My kids have seen them and tasted them at a friend’s house. I have casually called them “chemically laden poison.” Yep. That’s not giving them food issues at all. Sigh. So this week, as I’m busy healing and digging myself out of depression, I decided to just do something crazy. What if we just made rice crispy treats? No reason. No questions. My first instinct was to buy organic everything and modify the recipe (which is what I normally do.) But I fought that urge. Not this time. I bought the Kellogg brand cereal and the Kraft marshmallows. 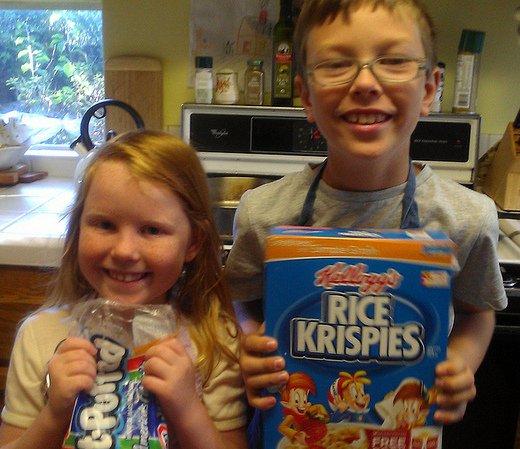 We tied on our aprons and prepared to follow the recipe on the box. I was proud that they questioned it, but also sad. Maybe they should not know about such things as small kids. Maybe I’m wrong in teaching them about our polluted food supply. No. Stop analyzing and questioning. It’s just rice crispy treats. Move on. 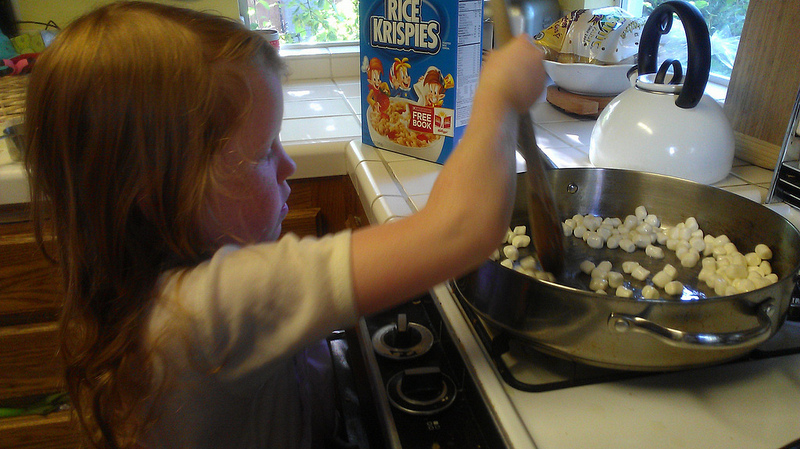 We added the butter and marshmallows. The kids took turns stirring them on the stove top and watching it all melt into goo. “That’s cool,” my boy said. I honestly can’t remember ever making these and was shocked at how easy they are to make. In just a few minutes we were done. They decided to use the pumpkin cookie cutter to make them more seasonal. We all wished we had some M&Ms to make a face on them. Maybe next time. We ate all four for dessert that night and they were unquestionably delicious. This entry was tagged Food, Parenting, Questions, Rice Crispy Treats. Bookmark the permalink. I can relate. Not to the specific things you are OCD about, but to the tendency. When I watch Mad Men, I sometimes wonder if we are all kind of compulsive today because we aren’t always half drunk they way they seemed to be in the 50s and 60s, if you can believe popular culture. I’m kidding, of course. Sort of.